For many parents vacation is just another reason to panic. Their children will have plenty of free time, and they do not know what to do to keep them busy, because they have so much energy they could destruct the entire house. It is up to you if the summer vacation is a learning paradise or a wasteland for your little ones. Nowadays children find extremely tempting to spend hours playing online games, and watching TV. If you have more than one kid then you may come home one day to see that the dog is blue, the walls are multi-coloured and the kitchen is on fire, because they will definitely want to experiment the things they see online. Take some time before vacation, and plan your summer activities, because you are the one who can help them explore new hobbies and improve their skills. And to preserve their skills, children do not have to study vocabulary and do math sheets all summer long, they have to get involved into activities that entertain them. Do you remember how many times a day you were racing towards a tree, scrambling up as high as you could? How many times your children have done it? Probably they do not even know they have the needed abilities to climb a tree. The majority of parents ban their children from playing outdoors, and this is not a bad thing, because they try to keep them safe. But nowadays parents have the possibility to join their children when they explore the nature if they visit an adventure park. Make sure that this summer you take your children to an adventure park. Even if you do not want to believe it, children love to play in dirt. Even if nowadays electronics are available and they can spend their days playing games, they will definitely love playing with other children and getting dirty. Depending on the specific of the park your children may even have the possibility to use tools to build birdhouses. They will be under strict supervision so there is no danger to get hurt while they use tools. Also, if the park features a rope bridge you should allow your children play, because they will improve their balance skills when they try to cross it. Even if they do not succeed to cross the bridge from the first try, and they fall into the pond, they will learn that patience, perseverance and balance are important. A museum has the power to provoke your children’s imagination because it introduces them to an unknown world and it offers them glimpses of unique environments. A museum is an educational environment where you can expose your kids to new experiences. When they visit museums they will definitely reflect on the things they see and they are curious to find more about them. This means that the process of learning will continue at home, when they will try to figure out what every one of the things they seen means. Children who visit museums often develop creative and critical thinking skills. All these skills will prove useful in the future, because they will encourage them to ask questions and open discussions. Many museums transform their galleries into laboratories of ideas where children can spend time and learn new things. Check the museums that made their programs accessible to children, and make sure that this summer you visit multiple types of science centres. Your children do not have to spend all the summer vacation at home. You can enrol them to a camp, where they can spend a part of the summer. There they will definitely have the most unforgettable experiences of their lives, and they will be thankful that you had this idea. Make sure that you load the rooftop cargo carrier of your car with the things they need for the camp. They will definitely try new things while being there, and they will step out from their comfort zone. They will do new activities, because even if they are afraid they will be encouraged by the fact that all the other children do it. When in a camp kids have the possibility to discover their passions and hobbies, because they will explore multiple activities. Camps help children develop social skills, because they have to work together to accomplish many of the tasks they are assigned. Also, they will develop leadership skills, because they will have to take turns and to fulfil the responsibilities they receive. Also, camps can help children become independent, because many kids have issues in making their own decisions. If you do not want to enrol your children to a camp, where they spend a few weeks away from home, then you should go camping together. But before packing all for a weekend in the woods, you should conduct a test. You should ask your children to sleep in a tent in the back of your house for a night. 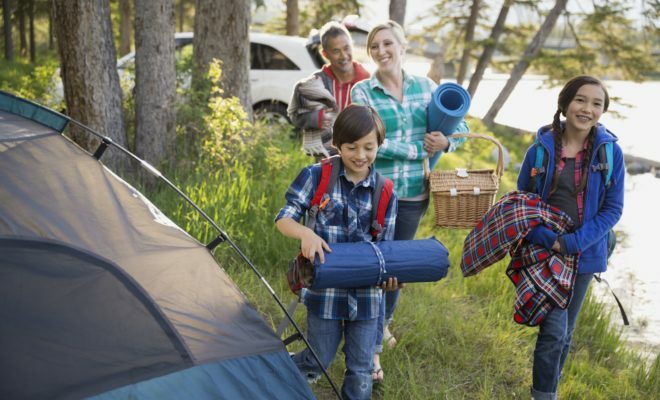 Check a parents guide for camping if you have never organised a camp until now. In case you do not have a tent, then you can rent or borrow one. Just because this is a trip together with your children, you should not over pack. Parents have the tendency to bring too many clothes and home items, because they do not know what they will really need. Make sure you are prepared no matter how the weather will be, because there are great chances the night to be quite chilly. You should teach your children how to build a campfire, because they will definitely want to repeat the experience when they are older. Keep in mind that children simply love breakfast camp bread, so you should make sure you know how to cook it. For a pop of sweetness you should sprinkle sugar and cinnamon on it before placing it above the fire. Do not forget to bring extra lighting, because even if you will have a camp fire, electrical devices can keep the bugs away. Previous Article Starting your own business – why Singapore?